ShortScale :: View topic - Know anything about bending wood? Know anything about bending wood? Posted: Mon Sep 07, 2015 2:19 am Post subject: Know anything about bending wood? Hey shortscale, so I've been slowly been getting interested in trying wood working again, starting small and moving up to perhaps taking another shot at making guitars. I've been playing my harmony h54/1 exclusively for the past year and I'm sort of longing to trying recreating one. I've had a bit of experience with making solid body instruments, and of course parts guitars but a few construction methods are a bit over my head, specifically bending wood. First off, I know there's a couple of methods of bending wood, specifically with a bending iron, steam bending or silicone heating blankets. Do you have experience in either? What's your preference? Secondly, I'm sorta drawn to trying using bending irons but most of the ones I've seen for sale are pretty pricey, diy or I gotta get one shipped from china. Any recommendations? I also had an idea of trying to use one of my retired radio shack soldering irons as a heating element, think it's worth a shot? Would making molds be a good idea even if I chose not to steam bend? I've read that some woods are harder to bend than others, I have some scrap mahogany (which I was thinking about using for some new cups for some grado headphones I need to repair) and I have a block of maple that's been sitting in my garage since I moved back home (hopefully it hasn't warped too badly) but I'm sort of interested in giving a go at buying some walnut. Once I get around to it I figure I'll experiment with what I have at hand but any advice is greatly appreciated. There are other ways to do it, for example routing the body like Rickenbackers or Epiphone Wildkats. The top can be carved, although that is a lot of work. Thanks man, but the method of routing out the wood seems sort of wasteful to me even if it might be an easier approach. The guitar I'd be copying has a slight carve on the top and back but I might skip that part if I get around to this. Thanks Chris, appreciate it. Looks like a good video about bending with steam. Gonna have to look into the arched backs and tops more. I have steam bent wood for furniture, but not guitars. I would guess the principles are the same. You need straight grain that does no run out the side of the wood on the face you are trying to bend. This keeps it from splitting. 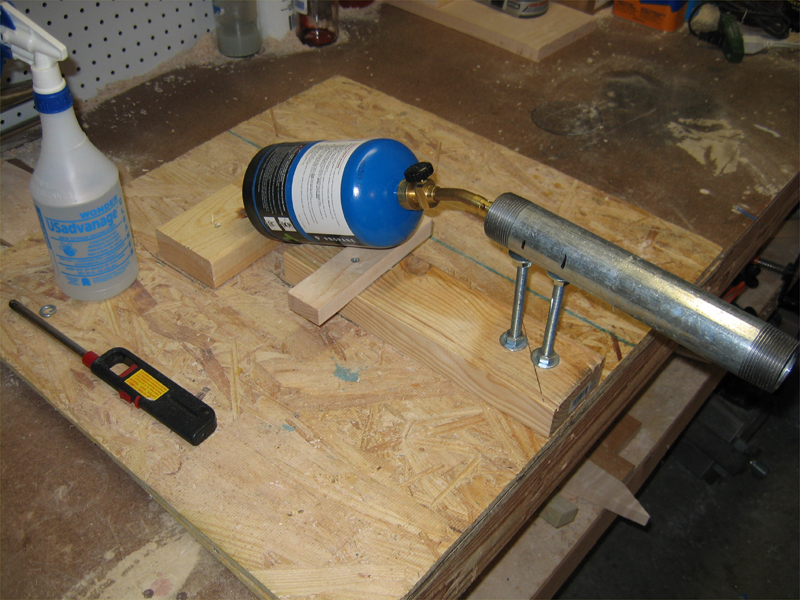 also, use a jig, that also backs the outer surface for the bend. I made my steam chamber from a tea pot on a camp stove and ran some tubing to a chamber I made out of PVC sewer pipe and caps. I kind of had to support the PVC chamber with plywood because it would get bendy as well. I made a little rack for the wood to sit on so it would be in the steam and not sitting in the precipitated water. But it was cheap and easy and I just used stuff I had lying around. I have also seen bending irons made out of hand propane torches (like plumbers use) heating up the metal iron. Thanks cur, as much as I don't want to make a jig to form wood to, it sounds like the right way to do it. I might experiment with that soldering iron idea I have, and if it doesn't well enough try steam bending. Here is what a propane torch set up can look like. easy-peasy. From what I can tell, all of the bending he's doing is without heat, although he's using veneer instead of thicker pieces. I quite like the 5-ply lamination process for the top and back (instead of carving them), I saw another video where someone used a vacuum mold to bend the top which is what I'm thinking of doing. My initial questions are related to the strength of creating a guitar out of veneers. I have read that the es-335 (which to an extent the harmony rocket is based off of) has a 4-ply top and bottom (335 site), but I'm concerned about how thick I need the sides, top and bottom for a sturdy instrument. The Harmony Rocket I have has a top that is 1/4" thick and I assume the back is the same, the sides are most likely somewhere between 1/16" and 1/8" (the binding is like 1/32" so I assume the sides have to be twice as thick so that the binding route doesn't cut into the perfing, but I can't tell for sure without dismantling the instrument, which I won't do). Anyway, I'm looking at raw veneers that are 1/32" thick and I'm wondering what I should shoot for, two veneers like on videos above would get me the 1/16" that I'm assuming the sides are. I'd need 8 ply to get that 1/4" top thickness, or should I shoot for 1/8" instead? Or is making a hollowbody "archtop" electric out of veneers not something you'd recommend? Thanks in advance for reading my wall o text, any advice is appreciated as always. Veneers should be stronger than solid equivelant and when you have the grain running in both directions, stronger still. Strength isn't an issue I wouldn't have thought. Not sure about the thickness issue, but in acousic guitars the binding does cut cut into the perfling somewhat. It's kinda why you use binding, it's not just decorative. You can join the top and back without binding but you have to make sure the contact between the top, side and perfling is perfect. There's a few methods to do it. I wouldn't be quite as keen on cutting into the perfling if I was going to use plastic binding as I'd trust a wood join more, but then I'm sure it works either way. What you could do rather than have individual or partial cut perfling is use solid/laminated perfling. Just run strips of veneers round the top and back edges of the sides. Would be pretty easy if you're using moulds and with the edges of the sides running parralel on an archtop might be easier than regular perfling? Think the main issue people have with laminated guitars is the sound. Not so much the back and sides but usually you get a better acousic sound from a solid top. I don't really think it's an issue if you're talking about a fully electic archtop as it seems mostly the pickups that are creating the sound, and it's acoustic properties will be all but lost anyway. The other issue with lamination would be that it's a total nightmare to repair as it shatters in different directions unlike solid which'll more than likely break along it's grain lines making it much easier to deal with. All that said, I quite fancy doing something similar at somepoint as I don't really like the sound of acoustic archtops anyway, but would like to build an electric one or two.